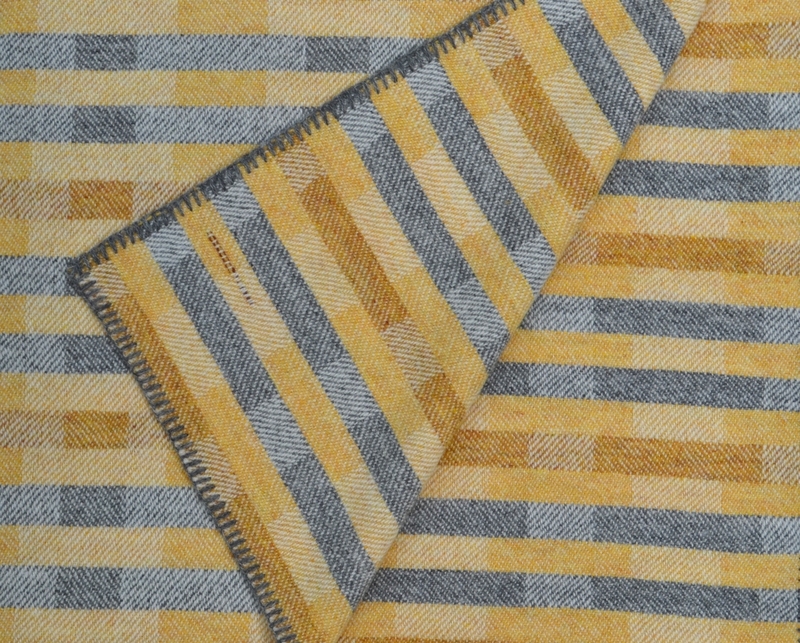 ‘Lineal’ in saffron, yellow ochre and grey is a clean, modernist, linear grid design inspired by vintage rugs produced by the great Swedish rug designers and weavers of the mid 20th century, such as Marta Maas-Fjetterstrom and Ingegerd Silow. 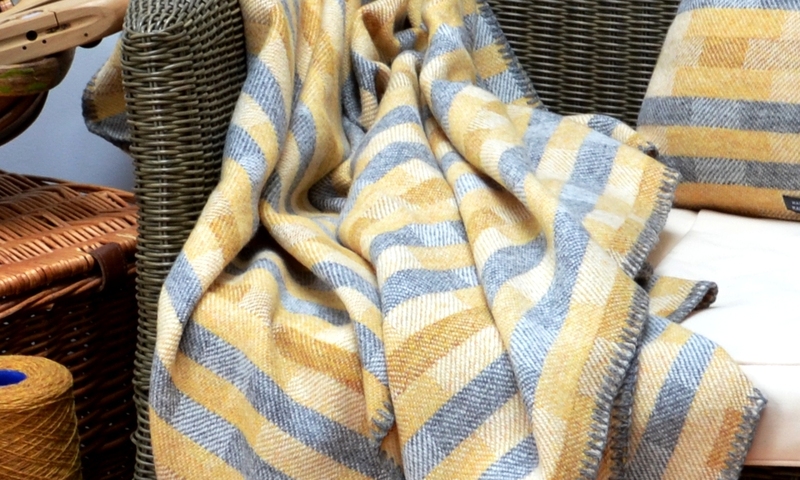 These are limited edition throws and a series of short lines in a contrasting yarn are woven into the corner of each throw to indicate its unique number – a one line throw indicates that it was the first throw woven in this design, etc.The throw is fully reversible with one side more strongly coloured and patterned and the other more muted. 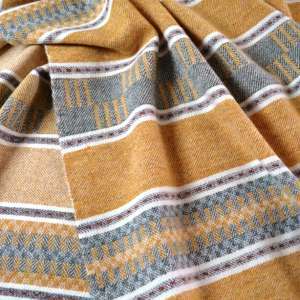 It is made of pure lambswool sourced within the British Isles. 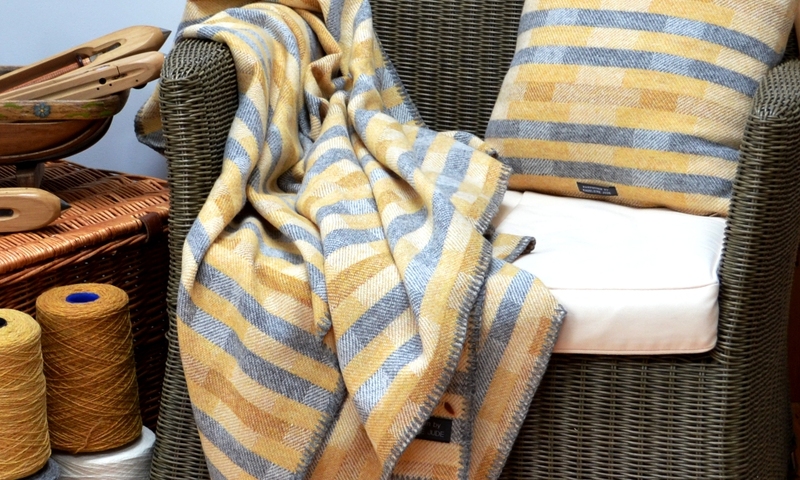 The weave structure is known as a reversing 3 shaft twill which gives the throw a wonderful drape. Each throw has been hand woven by me on a 32 shaft dobby loom in my London / Surrey studio. 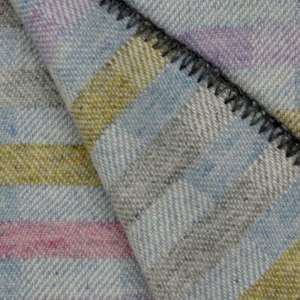 It is consists of almost 800 warp threads in ecru lambswool which are first wound onto the back of the loom. 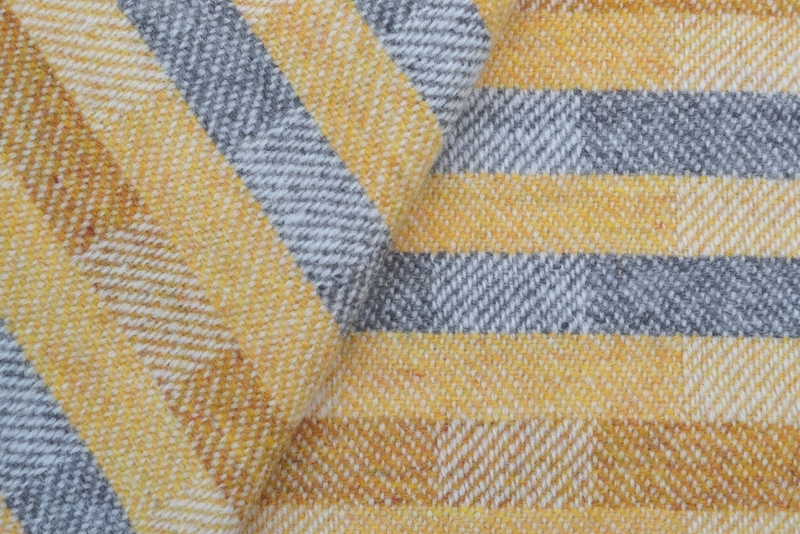 Working with three alternating shuttles I then weave the linear grid pattern of saffron, yellow ochre and mid-grey across this warp. It will take a total of 1,460 throws of the shuttle to complete the weaving of each one of these heirloom throws. Once the weaving is complete the throw is cut from the loom and the process of finishing begins. First it is scoured to remove the spinning oils present in the yarn. After this it is washed again to ‘full’ the cloth and make it wonderfully light, warm and soft. 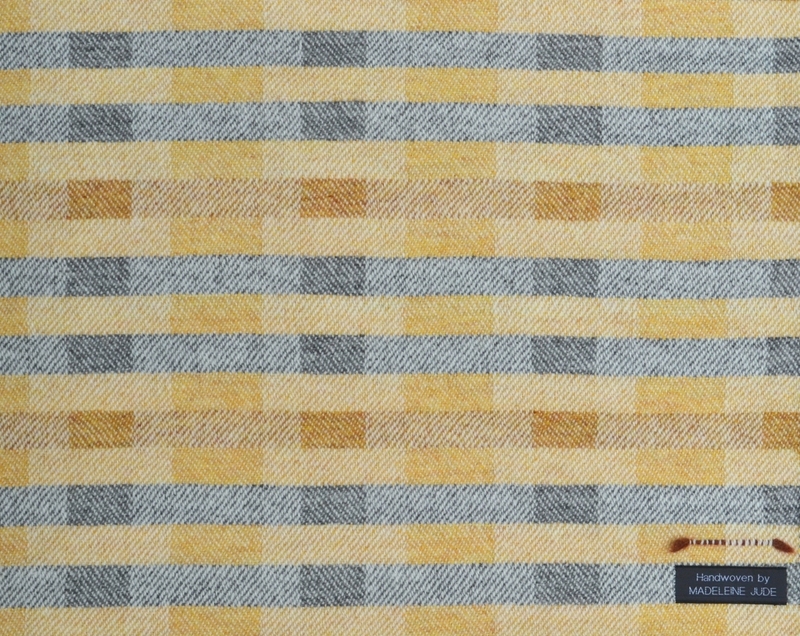 This fulling is what also transforms the stiff loom-state material into a durable and integrated cloth. To complete the throw I blanket stitch the edges on my vintage blanket stitching machine. 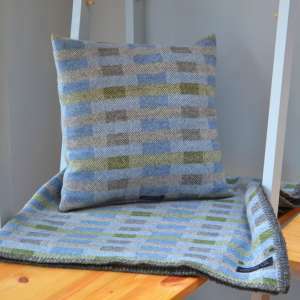 I use the same lambswool yarns that are used for the throw to do the stitching so a sufficient amount of yarn must also be hand washed, dried and wound onto a cone ready for use on the machine. Once this has been completed the throw receives its final steam press before I hand stitch its label. Dimensions: approximately 200cm x 110 cm (78” x 43”). Longer throws can be woven on commission. Please use the form on the contact page to make an enquiry. 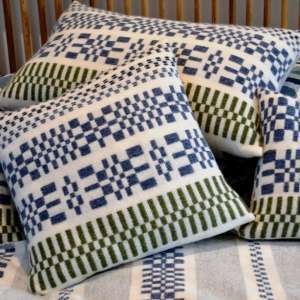 Matching cushions are also available to order. Although I have washed this throw as part of the process of making it, to avoid shrinkage it is best if you take this to the dry cleaners. However, to a certain extent wool is self cleaning so you may find all it needs is a good shake out and a little time spent outdoors on a breezy day to freshen it up. I am absolutely delighted with this beautiful throw, which I have just received through the post. The design is very sophisticated and \’quietly modernist\’. The colours are lovely (the photos give a true representation of the colour) and the quality is fantastic. I loved it as soon as I opened up the package. It looks wonderful draped over our sofa – and my son has enjoyed wrapping it around him too! Madeleine was lovely and very professional to deal with. She answered my inquiry swiftly and I received the throw two days after paying for it. A very satisfied customer.